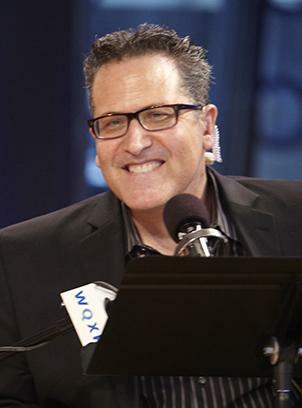 Elliott Forrest is the weekday afternoon host on WQXR. On top of providing the soundtrack to your evening commute and The Score at Four, he’s also the national host of the weekly concerts from the Chamber Music Society of Lincoln Center and hosted more than 60 concerts on stage at Carnegie Hall. On top of providing the soundtrack to your afternoon/evening commute and movie music during The Score at Four, Forrest is also the national host of the weekly concerts from the Chamber Music Society of Lincoln Center and hosted more than 60 concerts on stage at Carnegie Hall. For 6 years he directed the annual NY Public Radio productions of A CHRISTMAS CAROL. He’s hosted, produced and directed specials for PBS Television, including the oratorio, Considering Matthew Shepard and The Classical Comedy Contest from Carolines. For 12 years he was the host of A&E Television’s Breakfast with the Arts. For more than 20 years he’s been associated with Peter Schickele (PDQ Bach), appearing on stage with him and on his recordings. Elliott regularly produces live events around the country, including at Lincoln Center, Carnegie Hall, the Hollywood Bowl, Boston’s Symphony Hall and The Jerome L. Greene Space. He is the recipient of a George Foster Peabody Award and two Excellence in Broadcasting Awards from the New York State Broadcasters Association. What made you fall in love with classical music: I hit a new level of love and appreciation with Rimsky-Korsakov’s Scheherazade. When I latched onto the Sultan’s theme, so bombastic at the start and mellow at the end, I came to understand the storytelling power of music. Music-related obsession: In my spare time, I create large visual elements like video, animations and images to go along with classical music. I loved Disney’s Fantasia from a little kid and it has inspired me ever since to marry visuals to music. Host Elliott Forrest shares highlights of his summer jaunt to the Grand Teton Music Festival, with an audio interview, pictures and a complete musical performance. Take a respite from your busy work day and hear some of classical music’s best-loved composers performed by rising stars from The Juilliard School. On Monday, Oct. 16, pianist Leif Ove Andsnes appeared at The Greene Space to celebrate the release of his new Sibelius album. Watch the webcast here. Maxim Lando has played Carnegie Hall over a dozen times since his debut at six years old. He returns for opening night, playing alongside Lang Lang and Chick Corea. Listen as the East Coast Chamber Orchestra takes over the Naumburg Bandshell for an evening of Holst, Grieg, Shostakovich, Bach and Diamond. Hear Caramoor open its summer season with a concert celebrating the 20th anniversary of Bel Canto. At 7 pm on Friday, June 16, watch the Van Cliburn medalists in their first public appearance as winners. WQXR’s Elliott Forrest hosts the evening from The Greene Space. Take a respite from your busy work day and hear the Bordone Quartet, from Juilliard's honors chamber music program, play works by Schubert, Bartók and Mendelssohn. Take a break from your busy work day with pianist Drew Petersen performing works by J.S. Bach, Schumann and Liszt. The stars of the movie 'Florence Foster Jenkins' talked to Elliott Forrest about this infamous tone-deaf opera singer. Did Gershwin Get His ‘Rhythm’ from African-American Composer William Grant Still? Tony-nominated musical "Shuffle Along" posits that George Gershwin found one of his most famous themes while watching the original 1921 production. Elliott Forrest investigates. The filmmaker Robert Zemeckis has called Alan Silvestri his "creative soulmate" – a fitting description for the composer who has scored his films including "Back to the Future." Listen to the archived broadcast of Simone Dinnerstein and Ensemble LPR from Central Park, recorded June 30. Sharon Isbin's resume is a long list of groundbreaking firsts. In an interview with WQXR's Elliott Forrest, the guitarist expresses her hope for another first this year. Soprano Renée Fleming—who has worked in the worlds of opera, indie rock and even a Super Bowl — is opening next week on the Broadway. She spoke with Elliott Forrest backstage. "For all the talk of the graying classical audience, this enthusiastic crowd was as diverse in age and ethnicity as I've seen in a long time," writes host Elliott Forrest. Less than three weeks after the New York Philharmonic announced that Alan Gilbert will be leaving the orchestra, another podium-related announcement landed on Wednesday. Eric Idle, the famous member of the absurdist-comedy collective Monty Python, talks with WQXR's Elliott Forrest about his work in comedy and classical music.